The Anno 2205 closed beta has been cancelled. No reason was offered by this update posted on the Ubisoft Anno forums, angering those who pre-ordered based on the promise of access. Full details will be revealed "in the coming weeks" but there's mention of an "exclusive Command Ship" (thanks, Google Translate) and a social emblem. Fortunately the November 3 release date appears to be unaffected, though that's unlikely to pacify pre-order owners. The fact that the game is playable this week at Gamescom makes things worse, and it's also disappointing to see that the beta is still being advertised on the Ubisoft shop. 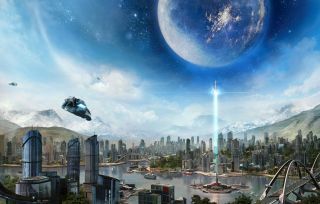 Anno 2205 is the latest entry in the increasingly good city-building series. It was announced at E3 this year, and will let you build on the Moon as well as planet Earth. Find out more in our hands-on preview, but perhaps don't pre-order anytime soon.